YUMMY! 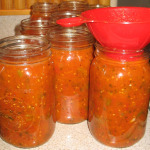 Canning spaghetti sauce is easy and well worth your time. My friend shared this recipe with me last year, and I love it! Learn how to make this delicious homemade spaghetti sauce with these simple instructions. Peel the tomatoes and chop them into bite size pieces. Another option is to put your washed tomatoes in the blender and puree them. 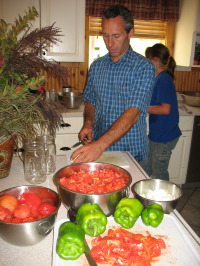 Combine the tomatoes, onions, green peppers, celery, parsley, garlic, and olive oil in a large stockpot. Note: I can fit 1½ times this recipe in one of my tall pressure cookers. Bring the mixture to a boil and cook it for ½ hour. Stir it every 3-5 minutes so that it doesn’t burn on the bottom. Now add the rest of the spices. Bring the spaghetti sauce back up to a boil and cook it over low heat for 2½ hours. Remember to stir your sauce every five minutes. Roma Tomatoes cook down faster than the other tomatoes because they aren’t so juicy. 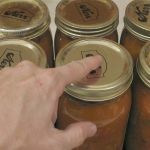 Fill your quart or pint jars with the spaghetti sauce. Wipe down the top of the jar before putting on the lid and ring. One batch makes about 10 quarts of sauce. 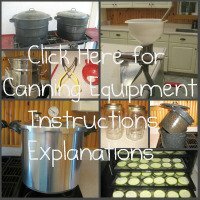 When canning spaghetti sauce, you can process your sauce in a boiling water canner or a pressure canner. Click on the links for complete details and processing times. Before storing your spaghetti sauce, check the lids for a seal. How do you know if your lids sealed? Make sure you Earthquake Proof your food storage room. When it’s time to use the sauce, add one can of tomato soup for each quart. 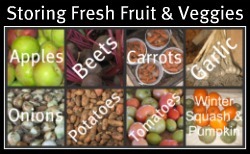 You can also add hamburger or other vegetables to the sauce.